Introducing our unique tote that is the ultimate functional Cat & the Fiddle themed bag around! For those working hard and in need of a functional bag, we bring you your new best friend! Everyone wants their bag to be stylish, yet spacious enough to carry a laptop, work essentials, some makeup perhaps and a couple of yummy and healthy snacks for the busy day ahead. It may even be used to sneak a kitty or two into the office with her…These bags are tote-ally awesome and are sure to fulfill all your requirements for the purrfect go to bag! Choosing which bag to match your daily needs and outfits can prove to be quite the challenge which you'd rather not have to think about first thing in the morning…we get it! So grab yourself a tote bag to save yourself the headache – we pawmise you won't regret it. 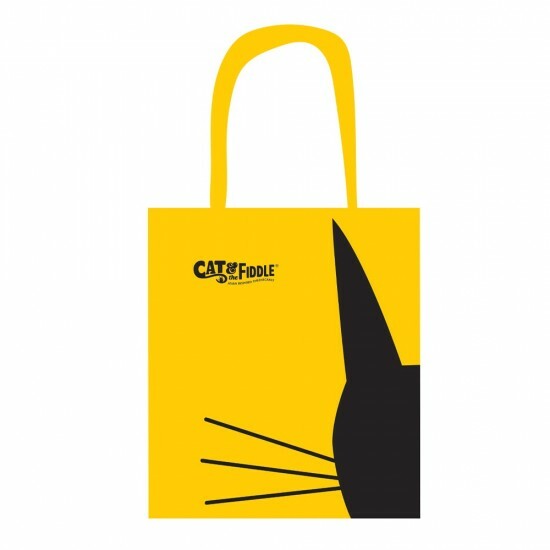 The cat tote bag is made with durable canvas to ensure all your important personal belongings stay safe and secure! Take these bags to school, the office or out with you on the weekends. These totes are great for the multi-tasking woman who is both stylish and fun! These stylish bags aren't only built for pure functionality, but for style too! We couldn't ask for more.